Alicia's Advice for Speaking Success: Evaluate. Repair. Learn. Move On. Evaluate. Repair. Learn. Move On. The wind came in fast as the sky darkened. The temperature outside dropped 10 degrees, a welcoming side effect of the coming rain storm. I sat on the back porch, enjoying the coolness of what had been a hot day, 96 just a few minutes earlier. Trees danced as the wind picked up and the rain moved in. After relaxing for a bit, I came inside to begin dinner. Standing at the kitchen sink window, I hear a really weird sound. Kind of a crack, crack then soft thud. 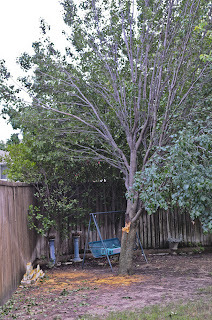 I open the blinds to the back yard and see half of my 30 foot Bradford Pear tree split in half. Half still standing while the other half rested on our wooden fence. “Rick!” I call out. “The wind broke our tree.” Rick emits a grumbled, annoyed response. Just a month earlier, we were talking about this tree. That it was time to come down. The grass wouldn’t grow, it affected our other tree’s growth on one side, and it wasn’t a long living tree. Rick actually began the quote request on tree removal from a few vendors. And while I was relaxing in the wind last night, I was still debating on whether or not I was ready for that tree to go. I really liked that tree. It blocked my back door neighbor’s view into our yard. 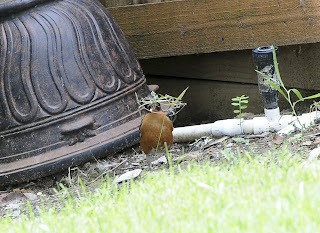 It brought robins, cardinals, blue jays, and mourning doves to the yard. It displayed fiery red leaves in the fall and bright white flowery dots in the spring. Well, Mother Nature settled my debate! This morning, we woke to a heavy, hot task of cleaning up the mess of limbs and leaves. We surveyed the damage. Fortunately, the heavy tree missed our carport by a foot. And only a few boards on the wooden fence will need to be replaced. It would be a fairly simple repair job. Next we moved onto the task of clearing away the fallen branches. Rick used his chainsaw to cut limbs into manageable sizes. I raked limbs and leaves into a wheelbarrow. Everything was neatly arranged in a pile in the front of our home for pick up. After our job as done, I sat on the back porch with a cold drink to rest. I noticed something interesting. A pair of robins appeared to be looking over the damage of the tree. The bright red-breasted male surveyed the grounds where chunks of bark and leaves rested. Then he flew to the fence near the tree appearing to investigate the large crack in the trunk. 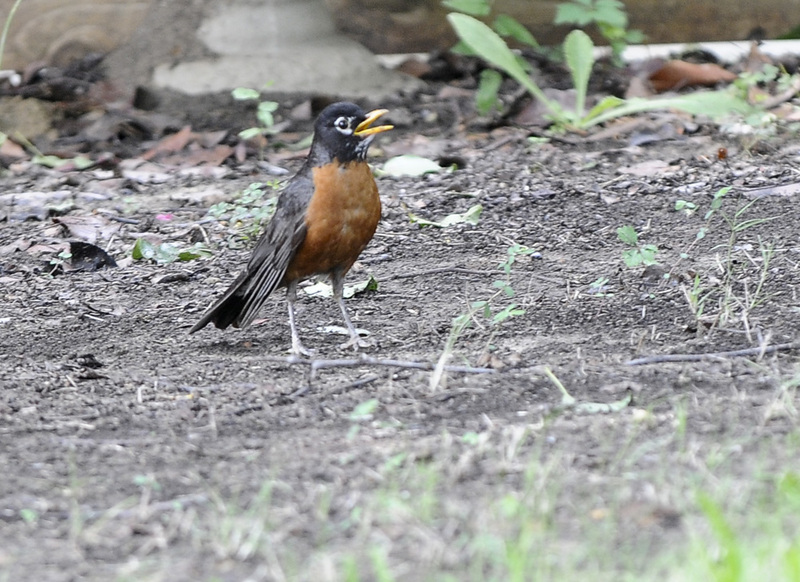 The female robin began to pick up sticks and leaves off the ground. She flew into a nearby tree where she was rebuilding a nest. I thought about this scene. We humans are not much different from a pair of robins. There was damage, items were displaced, we picked up the pieces. We moved on. There are two lessons from this story, one being if you wait long enough, someone will handle it for you. But I’d like to focus on the other lesson: when something goes awry, pick up the pieces and move on. Sometimes things just happen. For whatever reason. The best thing to do is: evaluate the situation, do damage control, and move on. Even after suffering damage to their nest from the storm, the “Robins couple” moved on and possibly learned they need to build a stronger nest. You, too, can learn from your mishaps and apply them to the next time, the next project, the next goal. Evaluate, repair, learn and move on. I really enjoyed this post. Keep 'em coming! Great story telling. Keep them coming.